Cynthia Sawatzky didn't go searching for her program. Instead, geology found her. She registered at Saint Mary's University, but had signed up late for first semester. Some courses she wanted to take were full, so she added an intro geology course to fill a science slot in her schedule. "I had no previous introduction to geology in secondary school and hadn't thought of it as a possible career path, but I ended up loving the intro course," Cynthia says about the class taught by Professor Victor Owen. His animated teaching style had Cynthia hooked. She loved it so much that she signed up for mineralogy the following semester with Professor Georgia Pe-Piper. This choice would later encourage Cynthia to pursue a research project in Geology that led to her declaring her major. The courses Cynthia took at SMU provided a good foundation of the fundamentals of geology, and the program qualifies its graduates for a range of entry level position in the mining, oil and gas, and environmental industries. "Geology is a great career choice," says Cynthia. "But it can be very competitive especially in this economy. Graduating with a degree is not enough to land you a full-time position," she adds. Cynthia recommends searching for summer student and co-op student positions at companies of interest to make the most of the program's opportunities. "It's a great way to get your foot in the door and make professional connections. The most passionate and dedicated people tend to be 'luckier' when it comes to landing sought-after new grad full-time positions," Cynthia says. She was among the "lucky" ones, landing a new grad position in 2012 at Nexen Inc., an oil and gas company based in Calgary. This was the greatest reward from the educational portion of the program for Cynthia. "I left SMU feeling confident in my abilities, supported by great friends and ready to start my career," she says. 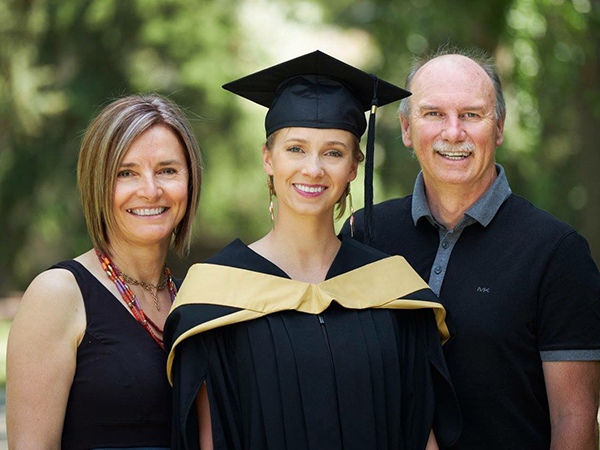 She has since completed an MSc program part-time at the University of Calgary through evening study and has been continuously improving and adding to her skill set. Cynthia's advice for anyone enrolling in this program, or wanting to pursue a degree in Geology, is to really try to deeply learn the course material. "I know it's easy to get caught up in just making the grade, but having a strong grasp of the fundamentals and the ability to take in and apply new learnings will help you succeed in a dynamic and fast-paced work environment." Cynthia tried to remember this as she was finishing her honours thesis, which was the biggest challenge for her. Her topic required a large amount of time-consuming data collection and many hours of microscope work. She says it was an exercise of great discipline to complete the data collection process. But Cynthia had the help from professors like Dr. Jacob Handley, who encouraged her to work very hard but not to take anything too seriously. And she says the program wouldn't have been half as fun without competition from her best friend, Dr. Erin Adlakha, who is now a professor at Saint Mary's. Cynthia says she feels prepared for wherever her career in geology may take her, and she looks back fondly on her time at Saint Mary's.